WATSONVILLE >> Wood speaks to everyone a little differently. The wood you prefer for your home or office may harken back to the trees you climbed as a child, the forest you camped in as a teenager or the kitchen cabinets in your first apartment, where your future spouse taught you how to cook. As the founder and president of Jackel Enterprises, a specialty lumber company, Steve Jackel understands this relationship. For 25 years he’s been helping customers see beyond anonymous lumber to the possibilities of rare, reclaimed and salvaged wood. To celebrate the company’s 25th anniversary, this second-generation family-owned business has consolidated multiple facilities into one 40,000-square-foot headquarters in Watsonville. In a space that includes offices, inventory and a custom milling and manufacturing facility, customers can see the transformation from forest to finished product right before their eyes. The result is wood that’s meant to be seen, touched and talked about. Reclaimed wood refers to wood from previous buildings or structures. For instance, the Jackel inventory currently includes rustic barn boards a designer hopes to repurpose in a custom home. The company also has dozens of elegantly weathered Douglas fir pilings reclaimed from the TransBay Pier in San Francisco, just waiting for their second act in a local seaside project. Wood from an old redwood water tank, acquired from the Lompico Water District, also awaits new life in the lumberyard. Salvaged wood comes from trees that have been removed due to age, damage or construction. Instead of going to the landfill, the trees are collected, processed and milled for reuse. Businesses and homeowners frequently use salvaging to offset the cost of tree removal, turning removed trees into furniture, floor or ceiling treatments. In 2013, San Jose State took down 28 English and Scotts elm trees on the campus. 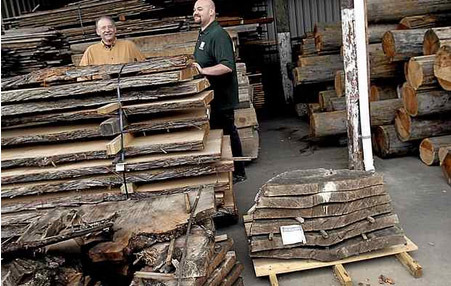 Jackel was able to salvage the 100-year-old giants, which were milled into slabs. Reusing wood like this reflects an ecological awareness and respect for nature, says Steve’s son Noah, the company’s vice president. Jackel Enterprises has been a certified member of the Forest Stewardship Council and Rainforest Alliance since 1996. The groups back environmentally appropriate, responsible management of the world’s forests. Ecological awareness is where it all began. After college in Lake Forest, Illinois, Steve Jackel moved to Santa Cruz in 1972 with his wife Barbara as part of the back-to-the-land movement. His favorite wood for dulcimers? Ready for a new challenge, Jackel started a lumber business from the back of his pickup truck in December 1991. Twenty-five years later, he employs 11 full-time staff, sells 450,000 board feet of lumber a year, and has 50,000 board feet of slab material stickered and drying in the yard. When most of us think of lumber, we picture stacks of symmetrical two by fours, their sharp 90-degree edges giving little hint to the trees they once were. Live edge slabs, however, retain the rough texture and curvaceous outline of the exterior surface, so you can still see the profile of the tree. These slabs are increasingly popular among architects and designers, and Jackel offers dozens of varieties such as Monterey cypress, grey elm and redwood. Lumber professionals point to characteristics such as “sapwood accentuating” and “visible vertical grain,” but what the average person sees is beautiful, warm wood that doesn’t hide its provenance. Internet shoppers can actually get some of a slab’s story right on the Jackel website. Click on “Slabs,” and shoppers can choose among numerous wood types, from black acacia to redwood. There’s a short history of the tree the slab came from, a general description of the wood, then a detailed description of the actual slab, with exact measurements and a price. There’s also a picture of every slab in stock. Time, not control, is essential to the slab process. 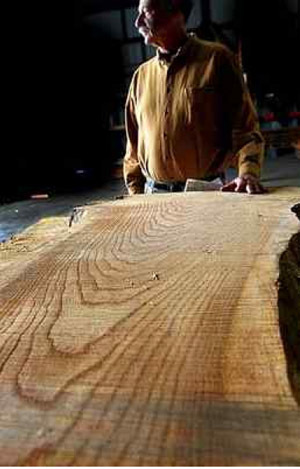 First, the main part of the tree trunk is laid on its side and cut horizontally using a band saw. At that point, the slab can be sold rough or custom milled to a client’s specifications. Back in the company showroom, the floor is still covered with butcher paper and boxes are piled in the corner waiting to be unpacked. While extremely proud of all they’ve accomplished, father and son are looking to the future in their new home, hoping to grow a business that will last 100 years or more.